While many NFL Draft prospects will be sitting in Chicago waiting to hear Commissioner Roger Goodell, call their name, the Draft’s top-2 QBs will be sitting at home. While Jameis Winston had been alluding to not attending it for a while now, it was just recently that Oregon’s own Marcus Mariota, said he will not be attending either. Most players tend to enjoy all the pomp and limelight of attending the NFL Draft, but Mariota said that he would prefer to be at home in Hawaii with his family. ESPN’s resident NFL insider, Adam Schefter, first reported that Mariota found it culturally important for him to celebrate the Draft at home with his family, rather than in Chicago. While no one can fault him for his choice to stay home, many are wondering about how this reflects on the NFL. 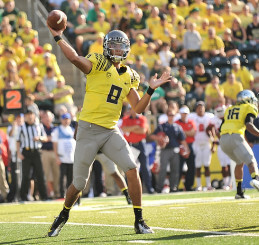 Likely to be a top-10 pick, Mariota will not be attending the NFL Draft. The NFL has always marketed the first round of the Draft as a Prime Time event that everyone should watch. So, one can’t help but wonder if their absence is just the beginning of the end for it. If the top-2 QB prospects are not going to attend the Draft this year, then who’s to say that it won’t become more common for top prospects to skip the Draft in years to follow? As conspiracy theories go, it’s not far fetched to think that two of the top prospects skipping the event could lead to more highly-visible prospects skipping it as well – potentially undercutting attempts to make it a must-see event. But the thing is, everyone who is saying that this will affect the Draft are missing the important part of the story; Mariota and Winston are not boycotting the Draft. Mariota watching the Draft from Hawaii is not an attempt to discredit the NFL. Mariota’s motivation for not attending has nothing to do with a desire to topple the NFL Draft or undercut Goodell. He simply wants to sit at home with his family and be comfortable, rather than sit in a hall in Chicago, wearing a suit and pretending to be surprised when he is drafted. Also, I’d bet that if Winston was asked about his motivation, it would be very similar to Mariota’s. In the end, the ”importance” of the Draft may be undercut by these “draft dodgers,” and if it is, then it is merely a side effect of the action and not the intention of these players.